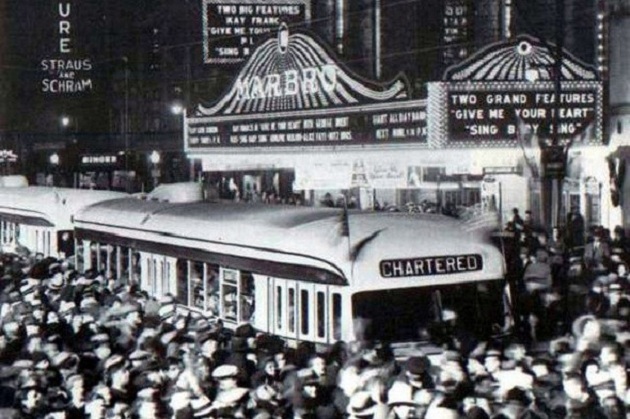 In 1930 the electric streetcar ruled Chicago. Though most people didn’t realize it, Chicago Surface Lines&apos; old reliable red cars were already on their way out. A streetcar line is basically an urban street railway, tied to tracks. That was good enough in the early years on the 20th Century. But now the automobile was becoming popular. If people were going to keep riding public transit, they needed more flexible service. CSL tried to adapt. 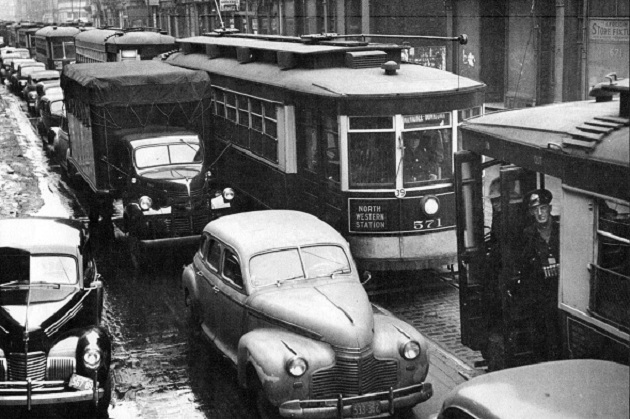 A rival company was already operating a few gasoline coaches on the city’s boulevards. CSL started its own bus lines. Since CSL had a heavy investment in electric power plants, it also introduced a bus that drew power from overhead wires, but was not tied to tracks — the trolley bus. These two types of buses were used as extensions and supplements to existing CSL lines. The company remained committed to the streetcar. With the Depression deepening and CSL plunged into receivership, there wasn’t money around for radical conversion. Meanwhile, manufacturers had developed a streetcar known as the PCC car. The new cars had a sleek Art Deco design, were comfortable, quiet, and fast. In 1936 CSL purchased 83 PCCs for the busy Madison Street line. The U.S. entered World War II in 1941. With gas rationed and rubber tires in short supply, CSL ridership increased. But when the war ended, the company faced the same old problems. In 1947 CSL was bought out by a new government agency, the Chicago Transit Authority. CTA executives considered streetcars old-fashioned. The agency did accept delivery of 600 newer-model PCC cars (“Green Hornets”) that had already been ordered. However, the older cars had to go. 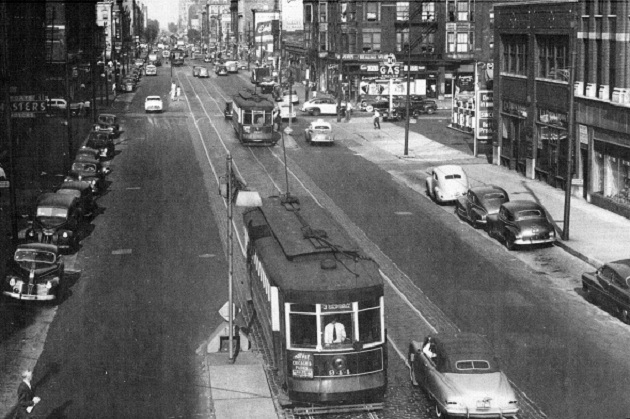 Beginning in 1948, CTA started replacing its streetcars with buses and trolley buses. The pioneer line on 93rd Street was abandoned in 1951. By 1954 only PCC cars were left, operating on just four lines—Cottage Grove, Western, Broadway-State, and Clark-Wentworth. One by one, these lines were converted, until only the Wentworth portion of Clark-Wentworth was left. 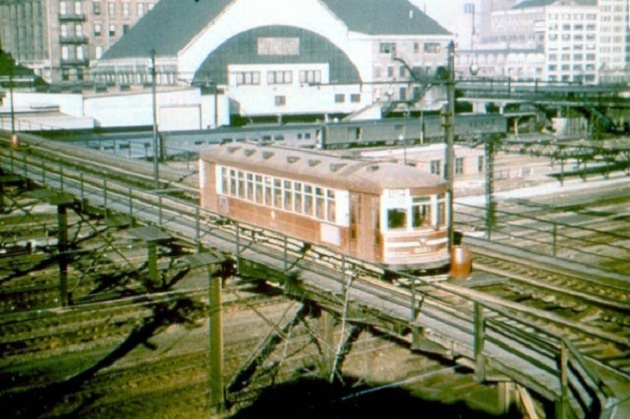 On June 21, 1958 PCC car #7213 pulled into the 77th-Vincennes car barn, ending 68 years of Chicago streetcars, and 99 years of Chicago street railways. Today many cities recognize that electric transit is green, and are rebuilding their streetcar systems. Chicago has no plans to do this.